On the 18th of December 2015 our experimental workshop at NIAAD in Uganda was opened by Dr. Bruno, Dagmar Woyde-Koehler and Dr. Kizito. 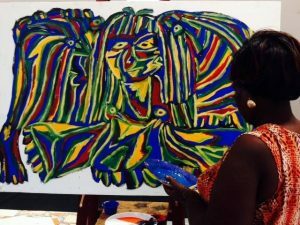 60 participants – composed of NIAAD students and various Ugandan artists – contributed their artworks, inspired by OUBEYs original works. They expressed their thoughts and associations on OUBEYs paintings VISUALLY by creating their own paintings. The atmosphere at our experimental workshop was as relaxed as intense. Very joyful for everyone. That´s one of the huge differences between the OUBEY MINDKISS approach of presenting and sharing and the approach of established museums and galleries. More than 60 paintings were created last Friday at the OUBEY Encounter Session. 3 of them were chosen by the MINDKISS project to travel further on with the Global Encounter Tour and be testimonial of the fruitful and inspirational encounter between OUBEYs paintings and Ugandan artists. Thanks to everybody who participated for this unique and enriching way of sharing and spreading the idea of OUBEY MINDKISS! On the 19th of December 2015 the exhibition at NIAAD was open to the public free of charge. We had so many intense and delightful talks with so many people at this OUBEY Encounter Session. So many posts and sharings by participants of the OUBEY Experimental Encounter Session were published these days – thanks to all of you for sharing and liking. Find exciting pics of this stopover of the OUBEY Global Art Tour on Social Media and more details in our next OUBEY newsletter, which will be released in the end of January. On 5 May 2015 the OUBEY MINDKISS Project will be celebrating its fifth birthday with a happening held at the ZKM Center for Art and Media in Karlsruhe –the very same place it first saw light of day on 23 March 2010.